Our organic tomatoes are bold and full-bodied with a subtly sweet finish making them a great choice for savory stews and succulent sauces. Organically Grown Whole Peeled Tomatoes, Organic Tomato Juice, Sea Salt, Calcium Chloride, Citric Acid. AFTER OPENING, REFRIGERATE UNUSED PORTION IN A SEPARATE CONTAINER. *The % Daily (DV) tell you how much a nutrient in a serving of food contributes to a daily diet. 2,000 calories a day is used for general nutrition advice. WHAT PROCESS IS USED TO PEEL CADIA® CANNED TOMATOES? 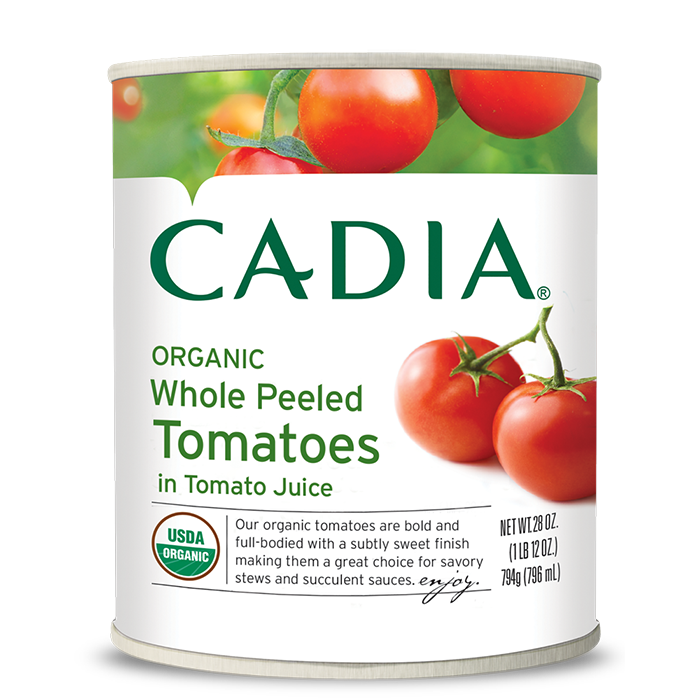 Cadia Canned Tomatoes are peeled using an anti-lye steam-peeled process. DO CADIA® CANNED TOMATOES CONTAIN SEEDS FROM THE TOMATOES? Although whole peeled items should not have any peel, any seeds the original tomato held will be included. In our endeavor to maintain the integrity of the fruit and shape as much as possible, the tomatoes cannot be cleaned out of seeds.